Posted on March 16, 2015 at 12:44 pm. The last month has been a big one for the online gambling world, from exciting new games to annoying new laws. Have a suss at what’s been going on at our favourite virtual casinos over the last few weeks. During the month of March, All Slots Casino is offering players the chance to get extra lucky twice a week by spinning the Reel o’ Fortune. This Irish themed game show was launched to get in the spirit of Saint Paddy’s day and offers guaranteed prizes for every single player. Simply spin the wheel and you’ll land on a tasty treat every time, scoring anything from free spins to bonus credits. The biggest cash prize up for grabs is $100, but what you really want to land on is free tickets to enter the 1,000,000 Loyalty Point Draw. The winner of the Loyalty Point Draw will be revealed on March 31st and the lucky winner scores loyalty points worth their weight in gold. During March, every $10 spent at All Slots will also earn you tickets to the draw, so there are multiple ways to win. Do you have the luck of the Irish? 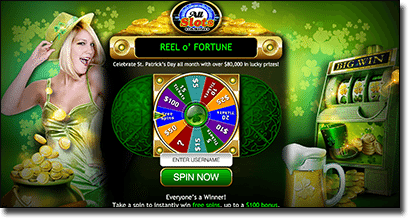 Pour yourself a Guinness and head to All Slots today to spin that sweet Reel o’ Fortune and join in the spirit of St Patricks Day. Never one to shy away from the spotlight, the crew at NetEntertainment have come up with yet another legendary pokies game to add to their already gleaming repertoire. Steam Tower has kept players waiting with baited breath since word got out about its release, with the wait finally over as of the end of February. This incredible game is everything we hoped it would be and more, as NetEnt prove time and time again that we never quite know what they are capable of. Steam Tower takes on a steampunk theme that follows a strapping hipster gentleman on his quest to save the princess from the evil dragon. Set against a Victorian era 19th century backdrop, the graphics are of A+ quality, not that we’d expect anything less from NetEnt. Using an innovative gameplay format, players have the chance to trigger free spins in order to level up within the steam tower to get closer to rescuing the princess. Triggering this bonus round also increases multipliers by magnitudes, resulting in the possibility to rack up some awesome winnings. Chief Product Officer of NetEnt, Simon Hammon, commented “Steam Tower is packed full of innovative developments and progressive features that NetEnt are renowned for. The Victorian era is synonymous with advancement and improvement, which reflects our own mission to drive the online casino market forward.” And we think they certainly nailed that one! Steam Tower is an exciting new online slots game and can be found for free play or real money wagers at several of our recommended casinos. With new mobile casino games popping up every few days, Microgaming have just added two hot titles to their mobile catalogue, bringing the list of Microgaming mobile games to over 230 titles. Players can now enjoy the Irish themed Lucky Leprechaun, a 20 line video slot based on chasing the pot of gold at the end of the rainbow, while blackjack fans will be thrilled to see another 21 variation formatted to mobile. Vegas Strip Blackjack Gold provides a fully customisable blackjack experience that now brings the ambience of a land based casino right into your pocket. Microgaming’s mobile catalogue can be accessed over a huge range of smartphone and tablet devices including iPhone, iPad, Android, BlackBerry, Nokia, LG, Windows Phone and many more. As their list of mobile games continues to expand, it’s only a matter of time before all your favourite Microgaming titles will be available for play on the go. In a move that shocked players, gaming software providers and online casino operators, Germany has reached the decision to fine any German punter making real money bets at foreign run casinos. While the laws regarding online casinos in Germany have always been a hot topic, this decision came as a blow as this is the first time the player themselves would be punished rather than the casino operator. To ensure they play no part in this mistreatment of customers, Guts Casino made the difficult decision to restrict German players from the casino entirely. Guts is confident the regulation will soon be overturned, but in order to protect loyal players they are closing down any accounts held by German players. Let’s hope the same thing never happens for Australians! German players can still legally bet online, but the casino must hold a German license.